V for... very nearly here? 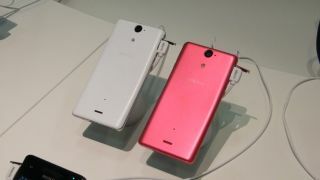 The Sony Xperia V will apparently go on sale in Russia before the end of the year, as the 4G handset locks its sights on the European market. According to Russian site Mobile Review, Sony Russia has confirmed that the Japanese-made handset will be touching down in December. Back in August we spoke to Sony about the Xperia V, when it said it was ready to ship the handset to any country where there was demand, and rumours suggest Sweden and France are also eying up the handset. The Sony Xperia V was unveiled at the end of August at IFA 2012 in Berlin, but this isn't the first LTE handset to grace the Xperia range – that accolade goes to the US-focussed Xperia Ion. Playing second fiddle to the flagship Sony Xperia T, the Xperia V sports a 4.3-inch HD display, 1.5GHz dual-core processor, 1GB RAM, 8GB internal storage, 13MP rear camera, NFC, 4G and comes running Android 4.0 Ice Cream Sandwich. Oh and the Xperia V is also dust- and waterproof, handy if you're of a clumsy disposition – or just work in dirty, damp environments. We've contacted Sony to find out what its plans are for the rest of Europe, and whether it's going to bring the handset to the UK now EE has its 4G network up and running.